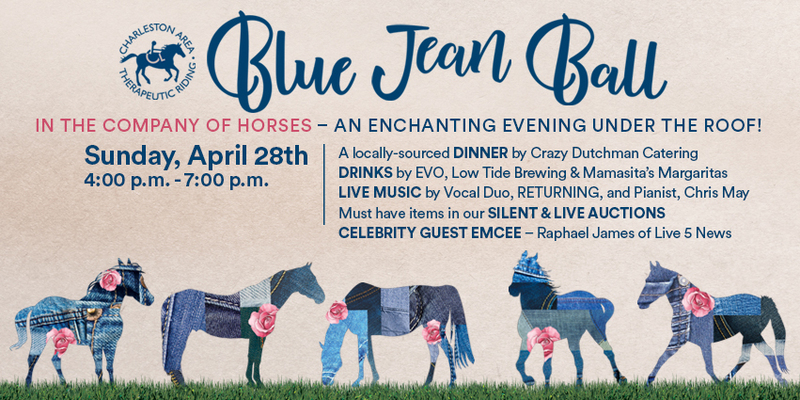 Throw on your favorite pair of blue jeans and boots for Charleston Area Therapeutic Riding’s Blue Jean Ball on Sunday, April 28th! Kick back at the farm with dinner by Crazy Dutchman Catering and drinks by Low Tide Brewing, EVO and Mamasita’s Margaritas. Enjoy live music by vocal duo, RETURNING, and pianist, Chris May and bid on exciting silent and live auction items! This event benefits CATR’s Scholarship Program that helps to provide therapeutic riding to over 170 children and adults with disabilities each year. This entry was posted in Fundraisers, Organizations. Bookmark the permalink.